Miss World Philippines 2016 pageant and grand coronation night will happen on Sunday, October 2, 2016. 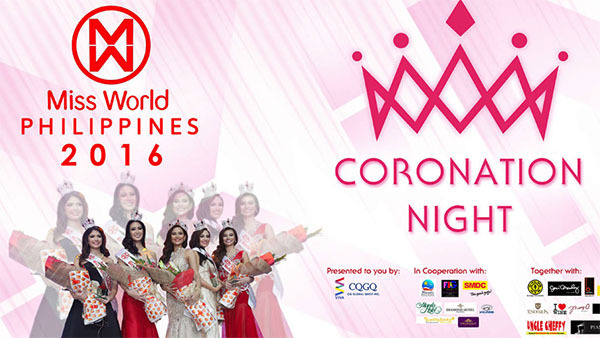 The Miss World Philippines 2016 is the 6th edition of Cory Quirino Global Quest, Inc. Miss World Philippines pageant. The event will be held at The Tent City, Manila Hotel at 7:00 pm. 24 lovely candidates will vie for the coveted title of Miss World Philippines 2016. Hillarie Parungao, the titleholder of Miss World 2015, will crown her successor at the end of the event. The winner will represent the Philippines in Miss World 2016 pageant to be held in Washington DC, USA. Where to watch Miss World Philippines 2016? The event will have a delayed broadcast on GMA-7 at 10 pm, live streaming channel is yet to be announced. Keep locked on the page! Miss World Philippines 2016 Pageant Night Live Blog and Coronation Coverage starts here. Q&A, Replay video, Final Results and Winners will be posted below!